Versatile, these skewers can be used to make perfect smores, sausages, hotdogs and more! Protective rubber tips for prongs, for perfect storage and safe handling around children. Pouch comes in a box for easy gift wrapping! ORDER OUR MARSHMALLOW STICKS NOW! Buy a set for yourself and a set for your favorite camping buddies! ✅ FINEST 304 STAINLESS STEEL - CORROSION RESISTANT, GREAT VALUE: Do you want the best tools for your outdoor campfire, Marshmallow Roasting sticks, that are compact and can be extended longer up to 45 inches? Marshmallow sticks that glow in the dark handle and more visible at night? Nontoxic Heat-Treated FDA Approved? At a price that actually makes sense? These are for you! ✅ GLOW IN THE DARK HANDLES - UNLIMITED LIGTHING FUN AT NIGHT, KIDS & ADULT'S BEST CHOICE: Enjoyable yet safe smores kit? You'll revel with these super long telescoping sticks - nonslip and comfortable finger grooves on the handle that gives you a firm and steady grip while roasting your favorite marshmallow or campfire food! Campers and traveler enthusiast say it's the all-around best choice for family camping or the casual night party at your home, beach etc. ✅ SAFE & SECURED - Adventure waits for no one, so we engineered a tool that provides the most fun, safety and enjoyable experience kids. The extended pole allows your kids to enjoy roasting their marshmallow while keeping them a distance away from the fire. The prongs' sharp tips are protected with rubber, making them perfect for handling around children. Note - Please use adult supervision with children to avoid burns and ensuring sharp ends are handled safely. ✅ AMAZING VALUE - PERFECT FOR THE WHOLE FAMILY: Our premium smores kit is perfect for roasting sausage, hot dogs, wiener and even fruits and vegetables. 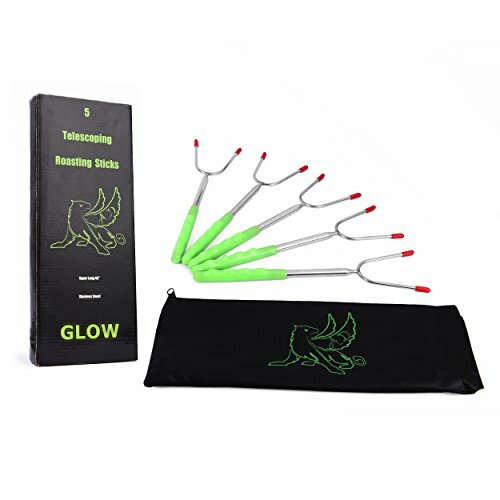 Our 5-piece extendable telescoping roasting stick set is perfect for the whole family or for the whole circle of friends and we made it EASY by including 1 zipper pouch for easy, compact storage. ✅ FEEL THRILLED, RISK-FREE GUARANTEED: Adults and kids' parents SAY this 'must have' addition to your camp cookout tools. It's SOLIDLY CONSTRUCTED, with a 30 day 'love it or your money back guarantee'. The ONLY glowing marshmallow roast stick forks you can buy in its' class! Works best is left in bright light before use! If you have any questions about this product by AD-Griff, contact us by completing and submitting the form below. If you are looking for a specif part number, please include it with your message.